Here’s the question that I really like to know when I was researching the Briggs & Stratton Elite Series 30470 gas powered portable generator – Is it any good? I have been on the lookout for a long time to find a generator that would suit both my household energy needs as well as meet my budget. Well, I would say I was lucky to stumble upon this one on Amazon.com/. I was exalted when the price came down that I immediately purchased one. I was pretty excited the day the freight was to arrive. The Elite Series 30470 came on a rolling semi truck that really surprised the quiet neighborhood. The semi truck left after unloading the generator into my garage with a portable fork truck. The job of assembling the gas generator was not tough, though I still had a complaint or two. The bracket that held the rubber feet was devoid of a hole into which it could be bolted into according to the instructions. This necessitated loosening of a vibration mount to install the rubber bracket. My assembly of the 30470 did not follow the original instructions, well there was another thing that I remember now. Though the manual said that there was an oil dipstick on the engine, it would be good idea to empty the whole bottle of oil that comes along into the motor. With a couple of minor problems related to the oil and the gas, the Briggs & Stratton 30470 generator chugged to life. There was no stopping after that, believe me! Earlier on I had a generator that I had to crank to start, but never again. I strongly recommend this portable gas generator to any woman who does not want to left in the dark high and dry, especially when there’s a row of cloudy days and there’s no sun light to charge up the solar panels. The generator possesses all the required features and is very easy to operate. You need not be a mechanic or a machine operator to start this generator and get it going. But it weighs over 200 pounds. It is a factor that can really put you off, but do not worry! Once the generator is on its wheels and the front brackets and rubber pads are attached, it is only the once-in-while maintenance and the firing up that you have to be worried about. Let me also warn you about the noise that it creates. The noise can mislead you into thinking that something is really wrong with the machine. It is a hunk of a machine capable of churning out 8750 watt when you needed it to. With that amount of power, you can power most of your essential electrical appliances at home when you needed it. Yes, that is sure noisy! My estimate is that the noise level is pretty much close to 100 decibels. You are surely going to receive some complaints when you run the generator if you live in a residential area. My complaints about the noise to Briggs and Stratton who referred us to Generac were of no avail. Even changing the muffler arrangement would be out of the warranty agreement, they contended. Now, I have no other option but build an enclosure around the generator to suppress the noise. This is going to cost me a couple of hundred dollars extra and I am going to have to wait for more time. This is one of the pet peeve I have about the generator. Though, the most attractive feature that made me purchase the product was the electric start. When I push it for the first place, the generator roared into life easily. 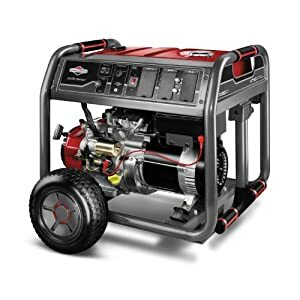 If you are looking to get the Briggs & Stratton Elite Series 30470 gas power portable generator, click on the button on the right to make your order from Amazon.com and have it delivered to your doorstep immediately.